Shortcodes in WordPress are small pieces of text that you can add to your posts and pages which are replaced by a corresponding piece of content when the post or page is published. For example, you could add the shortcode [ button ] into your post, and then when it is published, a button will be displayed in place of that text. You can also add additional information to shortcodes to enable you to customize them when they are displayed after the post has been published. This could include customizing the size, color, or many other variables. While you can create your own custom shortcodes for your website, there is a great free plugin available which adds over 30 of them to your website, allowing you to insert a range of elements into your content with ease. There are plenty of shortcode plugins available for WordPress, but Shortcodes Ultimate is a popular choice with over 970,000 downloads and a near perfect 4.8 out of 5 star rating. As the plugin is available for free from the WordPress.org plugin directory, it can be installed directly from within your site’s admin dashboard by going to Plugins > Add New and then searching for âShortcodes Ultimate’. 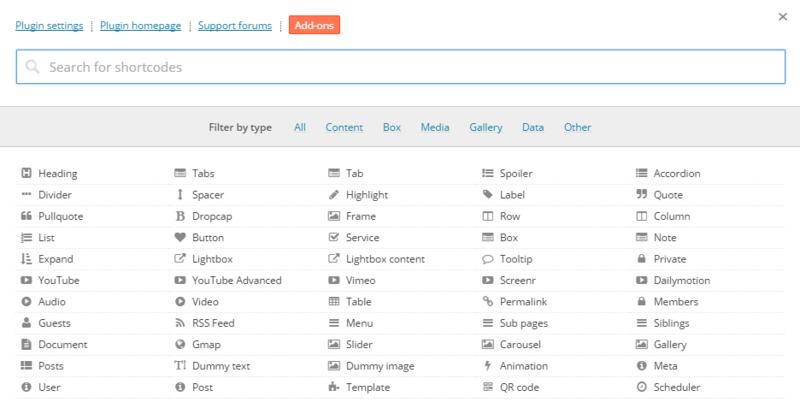 After installing and activating the plugin, a new item is added to the sidebar menu of your site entitled Shortcodes. From there you can adjust the settings of the plugin and watch the instructional videos. The examples menu item allows you to preview all the shortcodes that have now been added to your site, while the cheat sheet section gives you the ability to see what attributes can be added to each shortcode to customize and personalize them. However, to get started with this plugin and begin adding the shortcodes that will display the available elements in your posts and pages, you must either create a new post, or open an existing one for editing. From the post editor screen, you should now notice that a new button has been added to the editor menu entitled Insert Shortcode. By clicking on this button you can then choose from the available elements that you would like to insert into your post. After making your choice, you can then customize that element to determine how it will look and function on your site, or you can simply insert it as it is. When you are happy with it, you can click on the Insert Shortcode button to add it to your post or page. While in the post editor view it might not look very impressive, when you preview or publish your post and view it as a visitor would, you will now see the element you selected displayed instead of the shortcode. Its worth being aware that if you do disable the plugin at any point, the shortcodes will stop displaying the elements or content they were previously. Installing Shortcodes Ultimate on your site is a great way to start adding lots of useful and attractive elements to your pages. However, there are many other shortcode plugins out there so it is definitely worth taking a look at the available options to see which one has the best selection of elements that appeal to you while also working well with your website. If you are feeling adventurous you can even have a go at creating your own WordPress shortcodes. If you have any questions about this plugin or shortcodes in general, please leave a comment below. Thanks for the information, I will be sure to take a look at that plugin.